It’s little more than 10° out and the idea of stripping down to your bathers isn’t particularly tempting, but then you look around and see the steam rising from the bubbling waters of a natural hot spring and suddenly the cold doesn’t matter. 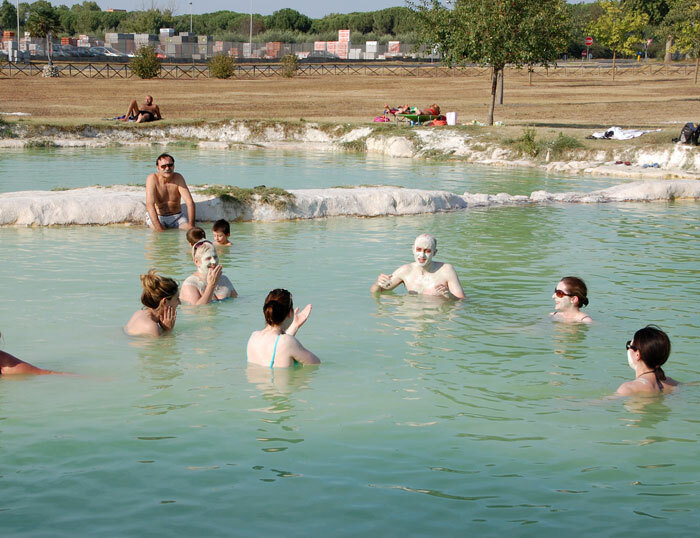 Italy has a surprisingly large number of hot springs, many of which are free and open 24/7. All of them are beautiful, but these are the ones that will make your jacuzzi bath at home look pretty plain in comparison. So don’t forget to pack your bathers! The undisputed queen of Italy’s hot springs is located in Southern Tuscany, about a two-hour drive from Rome (pictured above). In the days of the Roman Empire, society’s elite would travel across the country to take a dip in these warm waters, and very little has changed. The Guardian recently named them in the top 10 best hot springs in the world. Not bad for something that formed completely by accident. Water from this hot springs’ source flows down a river until it comes to a bend. Over the centuries, the constant pressure of the 37°C water as it goes around the corner has carved a mini waterfall. The water gushes down before coming to stop in a handful of romantic pools that have also been carved into the local travertine stone entirely without the help of human hands. While the Cascate del Mulino has become extremely popular in recent years, it’s still not a household name and you can often soak in relative peace, especially on an early winter’s morning. If you’re looking for a visual masterpiece, stick to the Cascate del Mulino. If you want something more private and more than ten degrees warmer, head to the Piscine Carletti in Viterbo, an hour outside of Rome. These springs are the domain of locals in the know, mostly because they’re almost impossible to find and appear to be located smack bang in the middle of a baseball field. But the water is a lot purer as you’re bathing almost directly on the source. It also doesn’t have the tell tale smell of sulphur (i.e. rotten eggs) you can expect from most hot springs, but which can put some people off. If you’re having trouble finding these hot springs, ask at the tourist office in town. The overwhelmingly tall cliff that towers over these hot springs will take your breath away. It’s called the Balena Bianca (White Whale) and is formed by sediments that are also found in the water. This white powder-like substance settles on everything from rocks to trees, so you’ll feel like you’ve stumbled into a snow-covered wonderland. Since these hot springs are hidden deep in the forest, it’s a bit of a hike. There are plenty of bathing options though, which is convenient since the water closest to the source is a very toasty 48°C. Keep an eye out for the natural and artificial pools along the path to the Balena Bianca. The Bagni San Filippo are an hour outside of Siena. For something in the north, the Terme di Bormio is your best bet, located three hours from Milan. There are quite a few spa resorts here, so you might have to ask for directions to this free site. It sits on the banks of a stream in a typically Northern Italian valley surrounded by forests of pines stretching into the horizon. This hot spring is manmade and collects in a red and grey stone pool that can be a bit tight in some sections, especially if the people around you decide to do laps. Still there’s something to be said about soaking in decidedly warm water while every other surface around you is coated in a thick layer of snow. 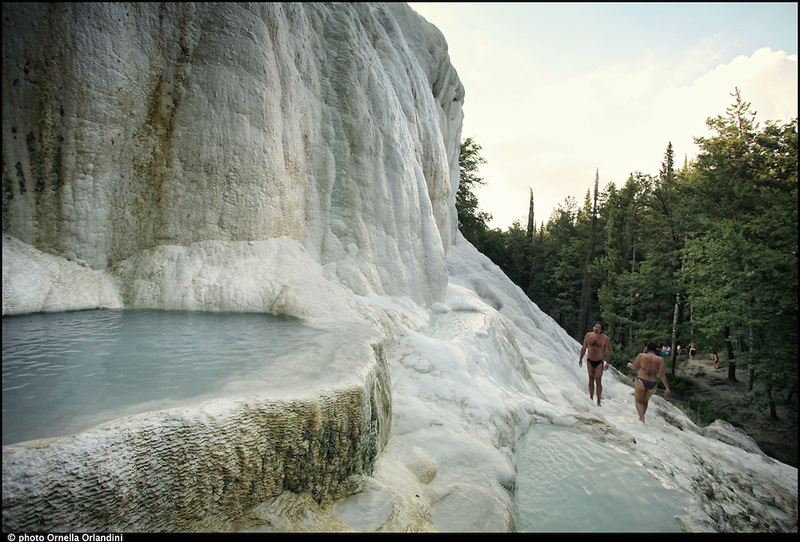 Spectacular and free hot springs aren’t reserved to Italy’s mainland. The country’s biggest island has its own amazing spot, which is located at the foot of a volcano. The sight of the smoking pits, called fumarole, that surround these hot springs can be a little unsettling, but the threat of a Pompeii-style eruption is almost non-existent. So put it out of your mind and concentrate instead on the rather strange grey people who populate the hot springs. 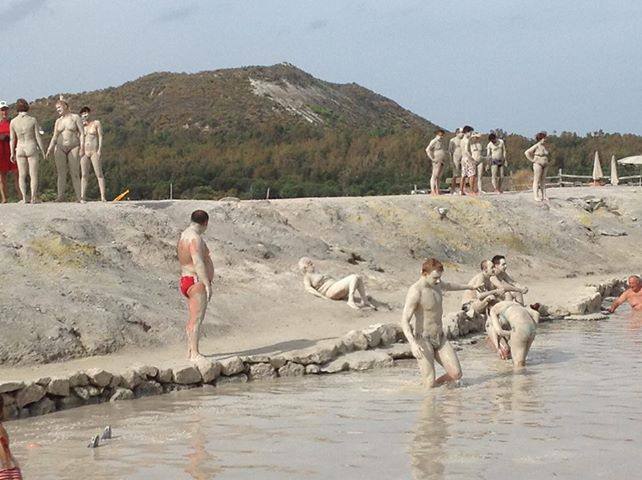 The biggest drawcard for the Terme di Vulcano, aside from their proximity to the crystal clear waters of the nearby beach, is the mud, which is believed to help with joint pain. People far and wide slather themselves in the stuff and relax while it hardens to the consistency of concrete.